This is a healthier spin on taco salad but you will still enjoy the great taste. 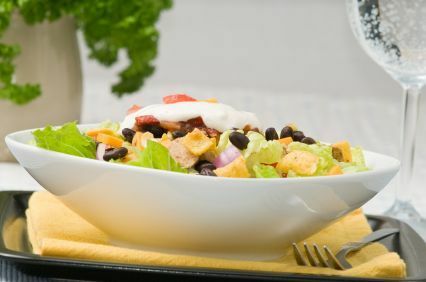 This is a healthier spin on taco salad but you will still enjoy the great taste. Brown turkey and then add the taco seasoning. Chop lettuce and add kidney beans and onion. Rinse the lettuce, onion and kidney beans. Add the turkey and cheese to the salad. Crush tortilla chips and add to the top of the salad.